Marietta National Cemetery is located half a mile east of central Marietta, Georgia, and 20 miles northwest of Atlanta. Burial sections are laid out to follow the site's undulating topography in shield, circle, oval, and crescent shapes, while views of Kennesaw Mountain, Stone Mountain, and the city of Atlanta provide scenic backdrops, creating a picturesque memorial to America's fallen military veterans. The cemetery features a monumental stone archway (one of only five in the national cemetery system), several distinctive memorials, and a stone boundary wall that dates to the early 1870s. Marietta’s first major involvement in the Civil War came on April 12, 1862, when Union spy James J. Andrews and twenty-four of his men boarded “The General,” a wood-burning locomotive, while the passengers and conductor were stopped in Marietta for breakfast. “Andrews’ Raiders,” as they are known, took off in the engine and headed north, cutting telegraph lines and tearing up rail tracks along the way. The train’s conductor and others gave chase, commandeering two other trains as they encountered broken tracks. When the Raiders reached Ringgold, Georgia, 80 miles northwest of Marietta, they jumped from the train, scattering in the forest. Andrews was captured and eventually hanged in Atlanta. Nineteen of the Raiders received the Medal of Honor, including six who were the first recipients of this prestigious award. Two years later, the Union prepared for the Atlanta Campaign, hoping to quickly divide the Confederate army, sever major transportation and communication lines, and decimate Atlanta, a major southern manufacturing center. Major General William Tecumseh Sherman massed more than 100,000 men, including the Armies of the Cumberland, the Ohio, and the Tennessee, and set out from Chattanooga in May 1864. They faced off against 55,000 Confederate soldiers led by General Joseph E. Johnston, and later General John B. Hood. On June 10, the Confederates set up a defensive line north of Marietta, between Pine Mountain and Brush Mountain. Heavy fighting that lasted for several days forced Johnston to retreat to a new position at Kennesaw Mountain. In this vicinity, the Union and Confederacy traded victories at the Battles of Kolb’s Farm and Kennesaw Mountain, respectively. Eventually, the superior Union numbers pressed the Confederates back towards Atlanta to the south and east, with Sherman finally capturing the city on September 2. In November, the city of Marietta became the first casualty of Sherman’s “March to the Sea,” after Union General Hugh Kilpatrick set the city ablaze. 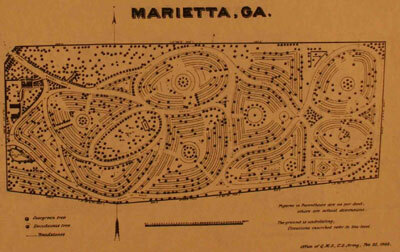 1893 Site Plan of Marietta National Cemetery. The site of the national cemetery was once a proposed location for the Confederate Capitol building. The owner of the land, Henry Greene Cole, a Marietta businessman and Union loyalist, refused an offer of $50,000 from the Confederacy for the land because he “expected to put it to a better purpose.” After the war, Cole offered to donate the property as a cemetery for both Union and Confederate soldiers, hoping to build goodwill and understanding between the two sides, but there was no agreement on the offer. 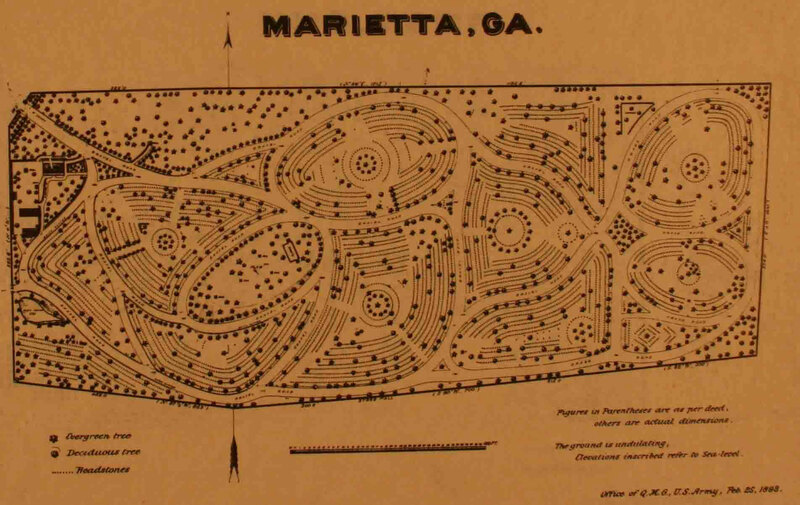 Eventually, Cole donated the land for use as a national cemetery, and in 1866, a program to reinter nearly 10,000 Union dead from Sherman’s Atlanta campaign began at the new cemetery, which was originally known as the Marietta and Atlanta Cemetery. To thank Cole, the Federal Government named him the first superintendent of the cemetery, and provided a burial plot for the Cole family. Henry died April 17, 1875, and is buried in Grave 1 of the Cole Section. The section now contains the remains of 17 of Cole’s family members. A plaque attached to the east side of the entrance arch is dedicated to Cole, while Cole Street, which forms the western boundary of the cemetery, honors the family. The cemetery is rectangular, bound by Washington Avenue Northeast, Rogers Street, Roswell Street, and Cole Street, and covers 23.2 acres. Designed by Union Army Chaplain Thomas B. Van Horne, the cemetery consists of 21 burial sections laid out in crescents, circles, ovals, and shield shapes, with concentric rows of graves within each section. The undulating terrain of the cemetery generally rises from the main entrance at the northwest corner of the grounds to a central hill where the flagpole and rostrum are located. The hill affords views of Kennesaw Mountain to the northwest, and the city of Atlanta and Stone Mountain to the southeast. Most pathways through the cemetery follow the site’s natural topography. The superintendent’s lodge, erected in 1921 to replace the original 1868 lodge, is a one and a half story Dutch Colonial style building with a stucco-clad lower level topped by a gambrel roof. It is located just inside the main entrance. The Greek temple-style rostrum replaced the original 1883 brick and granite rostrum southeast of the main entrance. Remnants of the old rostrum, including the brick piers, are now part of a wisteria arbor. The cemetery also retains its historic rubble stone wall, which dates to between 1872 and 1874. Henry Cole was originally contracted to provide the stone for a railroad bridge over Allatoona Creek, and the leftover stone was returned to his property. Before the Civil War, Cole hoped to use the materials to build his house, but instead the stone ended up being used for the cemetery’s two-foot, four-inch tall enclosing wall. The main entrance to the cemetery, at the intersection of Washington Avenue Northeast and Cole Street, is marked by a dramatic monumental archway over 35 feet tall, one of only five such archways in the national cemetery system. 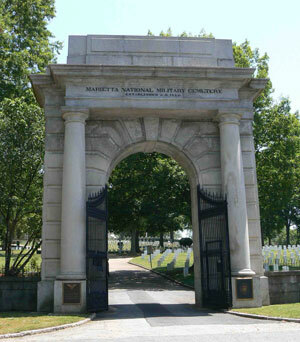 The Marietta arch is the last of the five, dating to 1883, while the others at Nashville, Chattanooga, Arlington, and Vicksburg National Cemeteries date from 1870 to 1880. The arch features Doric columns, and an inscription that reads, “Here rest the remains of 10,312 Officers and Soldiers who died in defense of the Union, 1861-1865.” A second entrance is located at the center of the cemetery’s western edge. The cemetery closed to new interments in 1970, and contains more than 17,300 remains. Many of the first burials were of soldiers who fell on the battlefields of Resaca, Kennesaw, and Atlanta. In May 1870, the 20th Army Corps erected a ten foot tall by two foot square obelisk, located in Section B, dedicated to their fallen comrades. The State of Wisconsin sponsored a monument to honor 405 sons who died in Georgia supporting the Union cause. The twelve foot tall granite memorial is topped with a bronze badger. On Memorial Day 1925, more than 2,000 people attended its unveiling. Other monuments at the cemetery include the Gold Star Mothers Monument, erected by the Atlanta Chapter of the Gold Star Mothers in 1960, a carillon dedicated by the American Veterans (AMVETS) in 1968, and the Pearl Harbor Monument erected by the Pearl Harbor Survivors Association in 1996. John Clark, a veteran of the Revolutionary War who later rose to the rank of Major General is buried in Section D, Grave 10391. Clark also served in the House of Representatives from 1801 to 1803, in the Georgia State Senate from 1803 to 1804, and as Governor of Georgia from 1823 to 1827. Clark died in Florida and was buried there in 1832 while serving as an Indian Agent, but in 1923, the Daughters of the American Revolution reinterred Clark and his wife at Marietta. Major General Crump Garvin is buried in Section Q, Grave 108-B. Garvin had a distinguished 38-year career in the U.S. Army and was a veteran of World War I, World War II, and the Korean War. Marietta National Cemetery is located at 500 Washington Ave., in Marietta, GA. The cemetery is open for visitation daily from sunrise to sunset. No cemetery staff is present on site. The administrative office is located at the Georgia National Cemetery, in Canton, GA, and the office is open Monday-Friday from 8:00am to 4:30pm; it is closed on all Federal holidays except for Memorial Day and Veterans Day. For more information, please contact the cemetery office at 866-236-8159, or see the Department of Veterans Affairs website. While visiting, please be mindful that our national cemeteries are hallowed ground. Be respectful to all of our nation’s fallen soldiers and their families. Additional cemetery policies may be posted on site. 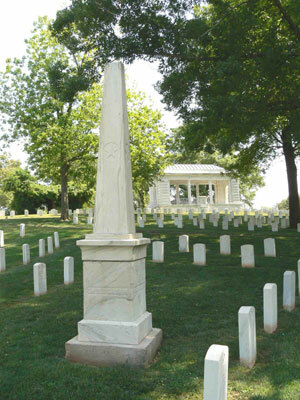 Marietta National Cemetery was photographed to the standards established by the National Park Service’s Historic American Landscapes Survey.